Fulbright New Zealand last night honoured 84 grantees of Fulbright and associated NZ-US exchange awards for 2012, at its annual parliamentary awards ceremony in Wellington. The event, hosted by Hon Steven Joyce, Minister of Science and Innovation, was used to announce 26 recipients of various Fulbright New Zealand Graduate Awards to study or research in the United States of America in the 2012-2013 academic year. 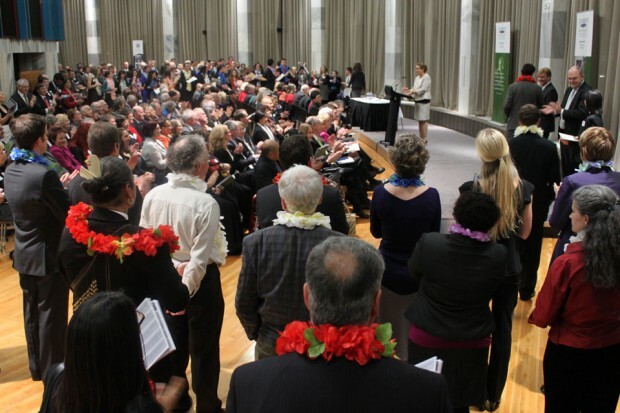 A crowd of around 300 well-wishers celebrated the achievements of those and other New Zealand and American participants in prestigious educational, cultural and professional exchange programmes administered by Fulbright New Zealand. The newly-announced Fulbright New Zealand Graduate Students included alumni of most New Zealand universities and one polytechnic, as well as several esteemed foreign institutions. They will be funded for one or two years of study or research to obtain a US masters degree or PhD, or conduct research in the US towards a New Zealand doctorate. Their fields of study and research range from clean tech entrepreneurship to cosmology, earthquake engineering, human rights law, performance viola and printmaking. Each student will attend the US university of their choice which are often world leaders in those fields. Also recognised at the awards ceremony were ten Fulbright US Graduate Students who are mid-way through an exchange year, 40 New Zealand and American academics, artists and professionals who have received Fulbright awards in the past year, and participants in the Ian Axford and Harkness Fellowships programmes which Fulbright New Zealand administers. New Zealand’s Fulbright programme continues to grow, and at last night’s ceremony two new award programmes were announced to commence in the coming year. Through a new partnership with the American New Zealand Association (ANZA) in New York, from next year a small number of extra graduate awards for American Fulbright students to visit New Zealand will be provided. In addition, the new Fulbright-Meg Everton Professional Enhancement Awards, funded by a bequest from a Fulbright exchange teacher from 1956, will provide for short exchanges by New Zealand educators to assist with their professional development through international experience in America. For an emerging New Zealand business leader to complete a Master of Business Administration (MBA) degree at a US institution and gain professional work experience in the US and New Zealand. Mahara Inglis from Wellington will complete a Master of Business Administration degree in Management and Entrepreneurship, specialising in clean technology entrepreneurship, at the University of California, Berkeley. For promising New Zealand graduate students to undertake postgraduate study or research at US institutions in fields targeted to support growth and innovation in New Zealand. Kenny Bell from Putaruru will complete a PhD in Agricultural and Resource Economics, specialising in climate change and environmental assessment of product life cycles, at the University of California, Berkeley. Sophie Briggs from Whakatāne will complete a PhD in Geology, specialising in the petrogenesis and geochronology of carbonatite rocks, at the University of California, Santa Barbara. Francesca Brown from Wellington will complete a Master of Laws degree in Law, Science and Technology, specialising in patent litigation, at Stanford University in Stanford, California. Sam Cormack from Wellington will complete a PhD in Physics, specialising in cosmology, at Dartmouth College in Hanover, New Hampshire. Matt Cutfield from Auckland will research the effectiveness and cost efficiency of energy isolators and dissipators in reducing earthquake damage to buildings, at the University of Nevada, Reno, towards a PhD in Structural Earthquake Engineering from the University of Auckland. Renee Johansen from Auckland will research the effect of invasive marram grass on the composition of mycorrhizal fungal communities in sand dunes, at Duke University in Durham, North Carolina, towards a PhD in Ecology from the University of Auckland. Amanda Lee from Christchurch is researching conversational language and verbal avoidance behaviours in adults who stutter, at the University of Iowa in Iowa City, towards a PhD from the University of Canterbury. Emma Marshall from Christchurch will research the impact of the Canterbury earthquakes and their aftermath on the relationships of couples, at the University of Minnesota in Minneapolis, towards a PhD in Psychology from the University of Canterbury. William Miao from Auckland will complete a Master of Environmental Management degree in Sustainable Urban and Industrial Systems, specialising in the creation of symbiotic environments for manufacturing plants, at Yale University in New Haven, Connecticut. Sarah Mitchell from Auckland will complete a PhD in Mechanical Engineering, specialising in computational solid mechanics, at California Institute of Technology in Pasadena. James Muirhead from Auckland is completing a PhD in Geology, specialising in interactions between tectonic and magmatic processes at the East African Rift in Tanzania, at the University of Idaho in Moscow. Frank Pega from Wellington will research the impact of family and in-work tax credits on the health of adults, at Harvard University in Boston, Massachusetts, towards a PhD in Public Health from the University of Otago. Kelly Ratana from Taupō will complete a Master of Science in Marine Science degree, specialising in marine and freshwater sciences, at Hawai‘i Pacific University in Honolulu. Jenni Tipler from Christchurch will complete a PhD in Structural Engineering, specialising in performance-based earthquake engineering design for the evaluation of new technologies, at Stanford University in Stanford, California. James Williams from Christchurch will complete a PhD in Applied Mathematics, specialising in mathematical computing, at Yale University in New Haven, Connecticut. For a promising New Zealand graduate student to undertake postgraduate study or research at a US institution in the field of natural disaster research. Jonathan Watkins from Auckland will research the design of seismic resilient buildings that utilise self-centering precast concrete walls, at Iowa State University in Ames, towards a PhD in Civil Engineering from the University of Auckland. For a promising New Zealand graduate student to undertake postgraduate study or research at a US institution in the field of indigenous development. Renee Wikaire from Christchurch will complete a PhD in Education, specialising in indigenous development through sport, at Florida State University in Tallahassee. For promising New Zealand graduate students to undertake postgraduate study or research at US institutions in any field. Michael Dobson from Wellington will complete a Master of Arts degree in Politics, specialising in environmental political theory, at the New School in New York. Bryony Gibson-Cornish from Christchurch will complete a Master of Music degree in Theory, History and Performance, specialising in performance viola, at the Juilliard School in New York. Alex Latu from Dunedin will complete a Master of Laws degree in Administrative and Constitutional Law, at New York University. Peter Martin from Wellington will complete a Master of Laws degree in International Law at Georgetown University in Washington, DC. Branwen Millar from Wellington will complete a Master of International Affairs degree in Human Rights, specialising in gender issues in international development, at Columbia University in New York. David Turner from Wellington will complete a Master of Laws degree in Human Rights and Constitutional Law, at Harvard University in Cambridge, Massachusetts. Lora Vaioleti from Hamilton will study and research using dialogue, future thinking and digital technology to increase resilience to climate change in the Pacific region, at the University of California, Irvine, towards a Master of Management Studies degree from the University of Waikato. Janna van Hasselt from Christchurch will complete a Master of Fine Arts degree in Printmedia, specialising in lithography combined with ceramics and painting, at the School of the Art Institute of Chicago in Chicago, Illinois. For information about this year’s other Fulbright grantees see our 2012 Fulbright New Zealand Grantees Booklet.